The only ingredients are salt and water so the recipe is pretty simple. 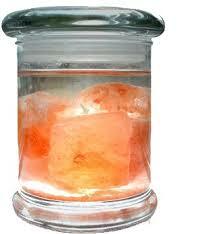 You’ll also need a glass jar with a plastic or non-metal lid. I used a regular mason jar. To use: Mix 1 tsp of the Sole in to a glass of water and consume every morning on an empty stomach. Do not use a metal utensil to measure or touch the Sole with any metal object. As with any health advice, consult a qualified practitioner before adding any new supplements, especially if pregnant, nursing or if you have a medical condition. To drink, add 1 tsp to a glass of water each morning before eating or drinking anything else. Do not add more, especially starting off! If this causes a detox reaction or headache, work up slowly. You can add some lemon juice.